Today is the luckiest day of the year, so we thought it would only be fitting to kick it off with a celebratory giveaway. 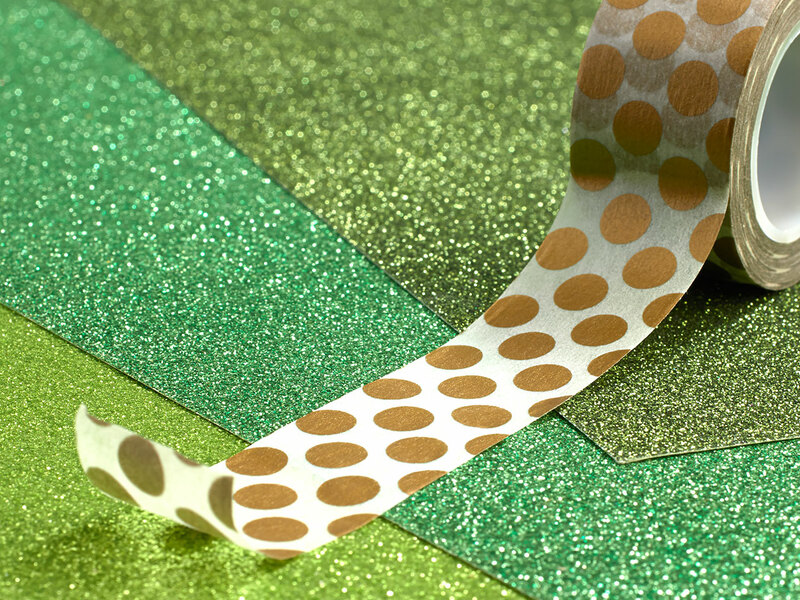 In honor of March 17, we’ll be giving away seventeen bundles of green glitter paper and gold polka-dot washi tape! Leave a comment below before March 19 for your chance to win one of these lovely bundles of green and gold! Happy St. Patrick’s Day! May today be your luckiest yet. I would love the green and gold papers and embellishments to use with my volumes of photos from 3 trips to Ireland! What a great washi tape and who doesn’t love glitter paper?!? Thanks for the chance to win. I sure could use these to celebrate my Irish heritage on a scrapbook layout! It was my Anniversary yesterday! What a great prize pack! Anyone would be lucky to win! Green is one of my favorite colors. Especially this time of year. I love all your products!!! Your paper is always beautiful! May you always have scrapping for your hands to do. May your pockets hold always hold a washi tape or two. May the sun shine on your workspace through your windowpane. May the rainbow of paper colours follow each rain. And may Close To My Heart fill your heart with gladness to cheer you. I love the glitter paper! Lookin to win me a pot of gold, sellin CTMH to the young and old. Me sites are set on the glittery green, the wonderful paper is what I mean. cause CTMH is just the best. I love Close To My Heart’s glitter paper! Green is my favorite color! oooh! Being an Irish gal, I’d love to win this bundle. Contrary to what they say, “All that glitters, IS gold!”. So fun! I am seeing some lucky projects in my future. CTMH products are the best, would love to WIN this Giveaway and start crafting with these Shades of Green! I love all the glitter paper colours that CTMH sells! LOVE CTMH glitter papers… would love to win some of the greens! Pretty! I love green! This glitter paper would be nice for some spring themed cards! I love those lucious greens. It reminds me of royalty out looking at a tall , long necked giraffe.Great for a fun zoo page or just a day outing. Love the green and gold! They look so great together! Thanks for the chance to win!